Spinal intramedullary tuberculoma (SIT) is a rare manifestation of neurotuberculosis. Concurrent SIT and intracranial tuberculoma are further unusual. Most of these tuberculomas respond completely to medical therapy, and surgical excision is seldom required. 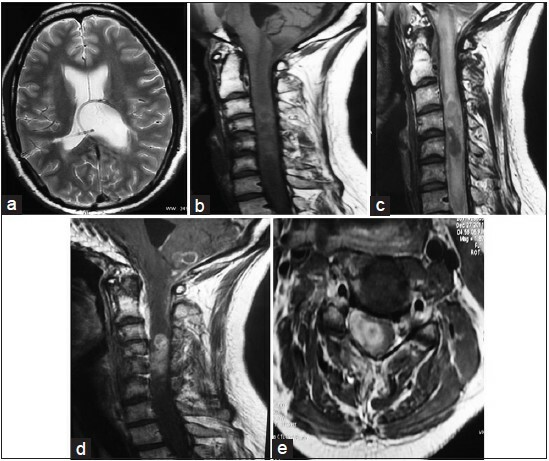 In this report, we describe a 17-year-old boy who developed cervical intramedullary tuberculoma at C3-C6 level with a concurrent lesion involving the right cerebellar hemisphere while on treatment for tubercular meningitis. This patient had paradoxical increase in size of the cervical lesion even though the cerebellar lesion showed regression in size. In this article, we discuss the paradoxical response to anti-tubercular therapy in central nervous system tuberculosis, possible causes of nonresolution of tuberculoma on medical therapy and evaluate the role of surgery in these cases. Paradoxical response to anti-tubercular therapy (ATT) is defined as development of new tuberculomas or increase in size of existing ones after a variable time interval from initiation of therapy. Most such lesions resolve on continuation of ATT with addition of steroids and surgery is seldom called for. Here, we present a case of a young boy who developed symptomatic cervical intramedullary tuberculomas after 6 months of initiation of ATT for TBM. There was also a co-existent cerebellar tuberculoma. The intramedullary tuberculoma failed to resolve despite continuation of the same including addition of second line drugs and steroids. The patient, however, showed improvement after surgical excision of the SIT. A 17-year-old boy presented with increasing asymmetric spastic quadriparesis for 1 year associated with sphincteric involvement of 10 months duration. He had past history of TBM diagnosed 6 months before the recent complaints. He was, since then, on four drugs ATT (isoniazid, rifampicin, pyrazinamide, and ethambutol). He also had a history of undergoing ventriculoperitoneal (VP) shunt on two occasions for postmeningitic hydrocephalus which was detected around 6 weeks after TBM was diagnosed. The patient was investigated outside for spastic quadriparesis and on the basis of magnetic resonance imaging (MRI), a diagnosis of cervical intramedullary tuberculoma (C3-C6) with a concurrent cerebellar tuberculoma was made and further drugs were added to the on-going ATTs. The neurological status however continued to deteriorate prompting the patient to attend our centre. On examination, he was conscious and oriented. He had hypertonia involving all the four limbs and deep tendon reflexes were diminished in bilateral upper limbs and exaggerated in both the lower limbs. Power was 0/5 on the right upper and lower limbs while it was 1-2/5 in left upper and lower limbs. Bilateral babinski sign was positive and graded sensory loss was present below C4 level. His hematological and biochemical parameters, including liver functions were normal. Chest X-ray was normal, and HIV and hepatitis-B serologies were negative. Magnetic resonance imaging of the cervical spine and brain was repeated in our institute. It showed a well-defined T1-hypo and T2-iso to hypointense mass situated within the substance of the spinal cord from C3 to C6 with conglomerate peripheral ring like contrast enhancement. There were no vertebral body or paravertebral soft tissue changes. MRI brain revealed mildly dilated ventricular system without periventricular seepage with bilateral VP shunts in situ. There was a conglomerate ring-enhancing mass in the lower part of the right cerebellar hemisphere as well [Figure 1]a-d. Comparison with the previous radiology report (unfortunately films were not available) revealed mild reduction in the size of the cerebellar lesion; however the cervical SIT had slightly increased in size (from 2 cm × 2 cm to current 3.5 cm × 3 cm size). In view of the lack of clinical improvement and increase in size of the SIT on continued ATT, we decided to operate him. C3-C6 laminectomy was done and after durotomy, the arachnoid was seen studded with small granulomas. Posterior midline myelotomy was done, and yellowish, soft, encapsulated mass was encountered within the cord substance. It was maximally decompressed after which the spinal cord was seen pulsating well. Postoperatively, the patient was electively ventilated overnight and extubated uneventfully next day. His postoperative course was uneventful. At discharge, he had mild decrease in lower limb spasticity. Biopsy was suggestive of granulomatous inflammation with caseation suggestive of tuberculoma, however no acid-fast bacilli (AFB) could be isolated from the lesion [Figure 2]a and b. He was discharged on four first line anti-tubercular drugs. At 6 week follow-up, the patient had slight improvement in neurological status (power improved to 3/5 in all four limbs). However, at 3 months follow-up, he had further deterioration in lower limb power to grade 1-2/5. Repeat MRI revealed lack of residual enhancement inside the cord suggesting a response to ATT but a syrinx was detected at C6-D1 level. The cerebellar tuberculoma had also disappeared [Figure 3] a-d. The patient was advised to continue ATT and regular follow-up. Spinal intramedullary tuberculomas can develop within the cord primarily or more commonly secondary to an existing focus elsewhere in the body. Secondary intramedullary tuberculomas are caused by hematogeneous inoculation of the tubercle bacilli into the cord substance or less commonly via cerebrospinal fluid (CSF) flowing across the central canal. Thoracic segment of the spinal cord, having the maximum amount of neural tissue proportionate to its length, is the commonest site for intramedullary tuberculomas. Cervical spinal cord is a relatively unusual location of SITs. Our patient had cerebellar tuberculoma in addition to the cervical intramedullary lesion. Concurrent cranial and spinal tuberculomas have been infrequently reported. , Such concurrent lesions are more commonly reported in immune compromised patients. The intramedullary tuberculoma in our patient probably resulted from the spread of tubercle bacilli ladened CSF along the central canal. There was a clear history of previous TBM and postmeningitic hydrocephalus in our patient. This prompted imaging of the cranium, which unearthed the cerebellar tuberculoma. Park and Song  have recommended prophylactic cranial imaging in patients with intramedullary spinal cord tuberculoma, especially if these were multiple so that intracranial tuberculomas can be detected when they are small and asymptomatic. 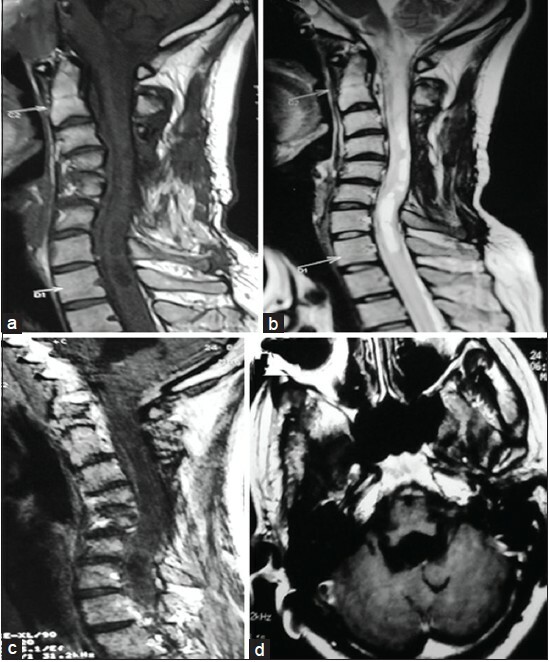 Spinal intramedullary tuberculomas present with subacute onset and gradually progressive myelopathy. They may simulate any other spinal intramedullary tumour especially if there are no other tubercular lesions in the body. As reported by Agrawal et al., such lesions may mimic intramedullary glioma both clinico-radiologically as well as by their intraoperative appearance. Such situations call for surgical excision especially if there is no improvement on ATT. In our case, the patient showed a decrease in the size of the cranial lesion but the cervical lesion rather increased in size with continued ATT. This raised three possibilities as far as the cervical intramedullary lesion was concerned. First, was it actually a tuberculous lesion? Secondly whether it was a case of secondary drug resistance? And finally, was it increasing paradoxically? The first possibility was ruled out by the histopathological examination of the mass. The role of histopathology as the most diagnostic examination cannot be overemphasized as noted by Agrawal et al. In fact, non-improvement on continued ATT and diagnostic dilemma are the commonest indications for surgical intervention in intramedullary tuberculomas. The point to be considered is that most tuberculomas usually respond well to the antitubercular chemotherapy with eventual complete resolution of the lesion. However, in our case, the cervical intramedullary tuberculoma did not respond to ATT. Thick capsule and chronicity of the lesion could be the reasons for the same. We believe that perilesional vasculitis and infarcts also hinder antitubercular drug delivery to the lesion leading to poor response. The possibility of secondary drug resistance was also considered in our case. This was because, with ATT, the patient had recovered from the TBM in the beginning and cerebellar tuberculoma also regressed in size. But, SIT failed to resolve with the same drugs. However, this possibility remained disputed as AFB could not be isolated from the intramedullary tuberculoma for culture/sensitivity and drug resistance studies. In fact it has been observed that isolation of AFB from tuberculomas, especially in India, is very difficult with a positive yield in only about 50% of cases. Moreover, CSF analysis and culture is seldom useful in tuberculomas. However, the fact that the patient did not improve even after addition of second line drugs did indeed put a question mark over this possibility. While paradoxical response to ATT appeared to be the cause of development of cervical SIT in our patient, we believe, chronicity of the lesion with an attendant thickened capsule and vasculitic changes, might have aided in its nonresolution on continued ATT. While most SIT respond completely to the ATT, surgical excision may be required in certain situations like (a) large lesion with neurological deterioration, (b) lack of improvement on ATT, (c) paradoxical increase in size on ATT and (d) diagnostic uncertainty. Our patient showed some improvement in quadriparesis after surgical decompression. Only a longer follow-up will show the extent to which the patient would regain premorbid status. MacDonnel et al. reported 65% improvement in neurological status in those who were operated. Thus, when patients are properly selected, results of surgery can be very good. But, in long-standing cases, because of prolonged cord compression and ischemia, the spinal cord undergoes irreversible myelomalacic changes. Hence, even after seemingly adequate surgery, clinical results may not be as expected. This underscores the need to intervene as early as possible. Cervical intramedullary tuberculoma with a concurrent intracranial tuberculoma developing as a paradoxical response to ATT for TBM is extremely rare. One should be aware of this paradoxical response to ATT while treating patients with CNS tuberculosis. Although continued medical therapy is curative in the majority of these tuberculomas, nonimprovement in clinical status and increasing size of the tuberculoma should prompt one to resort to their surgical excision for a better outcome in these patients. 1. Torii H, Takahashi T, Shimizu H, Watanabe M, Tominaga T. Intramedullary spinal tuberculoma: Case report. Neurol Med Chir (Tokyo) 2004;44:266-8. 2. MacDonnell AH, Baird RW, Bronze MS. Intramedullary tuberculomas of the spinal cord: Case report and review. Rev Infect Dis 1990;12:432-9. 3. Muthukumar N, Venkatesh G, Senthilbabu S, Rajbaskar R. Surgery for intramedullary tuberculoma of the spinal cord: Report of 2 cases. Surg Neurol 2006;66:69-74. 4. Thacker MM, Puri AI. Concurrent intra-medullary and intra-cranial tuberculomas. J Postgrad Med 2004;50:107-9. 5. Kayaoglu CR, Tuzun Y, Boga Z, Erdogan F, Gorguner M, Aydin IH. Intramedullary spinal tuberculoma: A case report. Spine (Phila Pa 1976) 2000;25:2265-8. 6. Park HS, Song YJ. Multiple tuberculoma involving the brain and spinal cord in a patient with miliary pulmonary tuberculosis. J Korean Neurosurg Soc 2008;44:36-9. 7. Agrawal A, Joshi R, Badole CM, Gangane N, Dwivedi S. Intramedullary diffuse tubercular lesion resembling glioma. Indian J Med Sci 2004;58:527-8. 8. Gupta M, Bajaj BK, Khwaja G. Paradoxical response in patients with CNS tuberculosis. J Assoc Physicians India 2003;51:257-60. 9. Ajay SK, Lakhkar BB, Bhaskaranand N. Intracranial tuberculoma manifesting during treatment. Indian Pediatr 1996;33:231-3. 10. Teoh R, Humphries MJ, O′Mahony G. Symptomatic intracranial tuberculoma developing during treatment of tuberculosis: A report of 10 patients and review of the literature. Q J Med 1987;63:449-60. 11. Van Bommel EF, Stiegelis WF, Schermers HP. Paradoxical response of intracranial tuberculomas during chemotherapy: An immunologic phenomenon? Neth J Med 1991;38:126-30. 12. Miyamoto J, Sasajima H, Owada K, Odake G, Mineura K. Spinal intramedullary tuberculoma requiring surgical treatment: Case report. Neurol Med Chir (Tokyo) 2003;43:567-71.